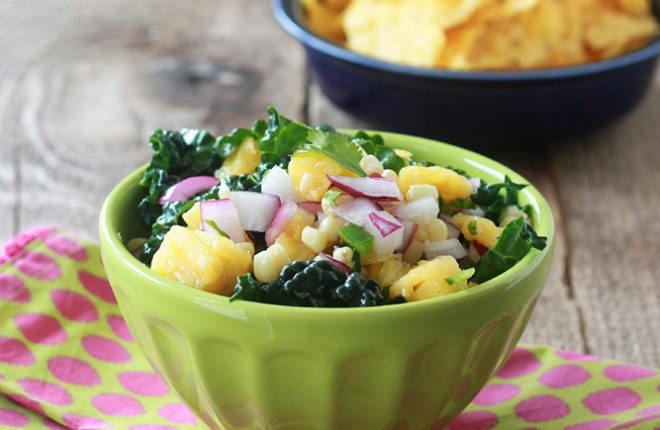 Juicy fresh pineapple, crunchy corn, and red onion are amped up by the addition of vitamin-rich kale in this creative and zippy salsa. From Julia Mueller's Let Them Eat Kale, a new cookbook that hit the shelves July 1. My blogging friend Julia is a pretty impressive gal. Aside from running a wonderful food blog, she has released not one but two cookbooks in the past year. That’s a hardworking and inspiring chicka right there. Her brand spankin’ new book, hot on the shelves just yesterday, is called “Let Them Eat Kale!” Yep – a cookbook all about kale. 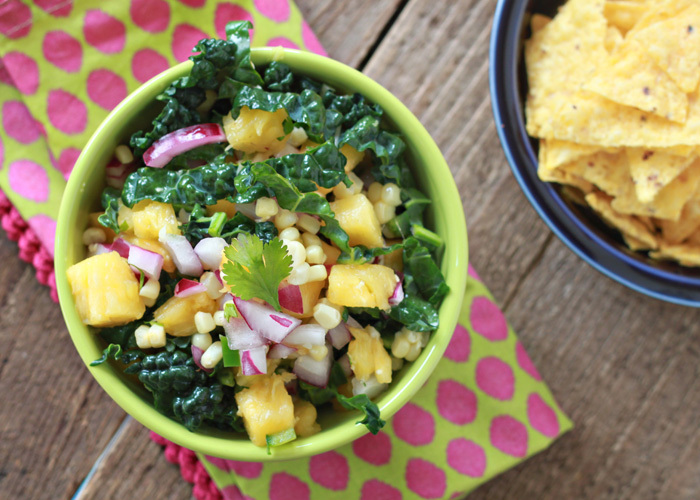 Kale is, of course, the star of every single dish in the book – including this Pineapple, Corn, & Kale Salsa recipe that I whipped up this past weekend. 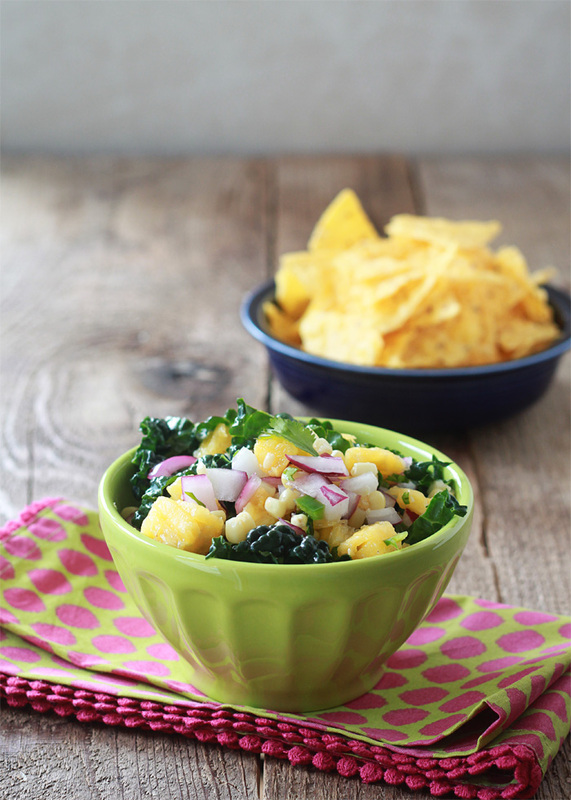 We loved this recipe – it is so fresh and healthy, with juicy pineapple, crisp kale, red onion, corn, and a nice zip thanks to fresh lime and ginger. Superpowered salsa – that’s a very good thing. Julia’s book includes 75 recipes using the green leafy superfood. With a wide variety of foods – from smoothies to snacks to appetizers to entrees – even kale haters are sure to find something to suit their fancy. Plus, the book includes info about the various varieties of kale, gardening tips, and tons of ideas for simply preparing the nutrient-dense leafy green. Not all of the recipe are vegetarian, but many are. And most are gluten-free. Would you like a copy of your very own? I’m giving one away to a lucky reader! Just leave a comment below and you’ll be entered into the drawing, which ends at midnight Pacific time on July 9. Meanwhile, though, try this salsa! We also found that we liked eating it as a salad, too – but that’s also because I cut the leaves a little too large. Either way, though, it’s good stuff. Leave a comment below before midnight Pacific time on July 9, 2014, to be entered into the drawing for your very own copy of Let Them Eat Kale. I’ll pick a winner via random.org on July 10. Thanks for entering! 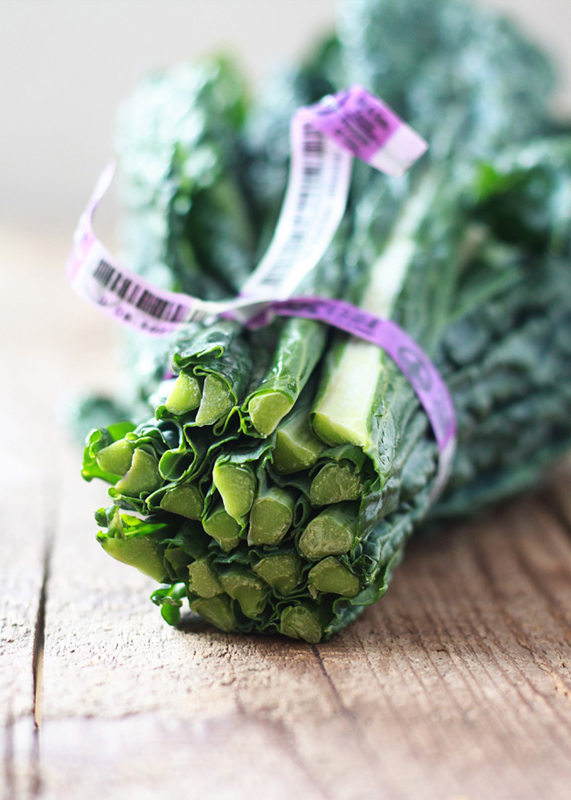 Add kale to a large mixing bowl and drizzle the lime juice over the top. Stir to coat the leaves. Allow leaves to sit about 5 minutes to allow lime juice to break down some of the fiber. Add the remaining ingredients to the bowl and stir together. Serve with chips, on tacos, or in burritos. I LOVE kale and am proud to say that it is now one of my husband’s favorite foods too! I would love to check out this book! I added some kale to my morning juice this morning (kale, cucumber, celery, apple, lemon, ginger) — yum! I LOVE fruit in savory dishes! Especially pineapple; it’s amazing on pizza, but never thought about putting it in a salsa, much less a kale salsa. Excited to try this recipe! This salsa looks great. I would love a copy of this book! Hi Deepa, looks like you’re the winner! Please email kitchentreaty@gmail.com with your mailing address and we’ll have a copy sent to you ASAP. Congratulations! I’m a nutrition major and am always looking for healthy and tasty new recipes. This looks amazing. I am just a beginner with using Kale, this cookbook would be great to have. Omg. Too funny. I hated vegetable growing up and pretty much most of my adulthood too. If anyone had suggested that I would be this worked up about a kale cookbook I would have told them to lay off the glue sniffing! My picky picky daughter has recently discovered kale and LOVES it! I need to get on board!!! Yaaay! I’m so glad you tried the pineapple salsa! This is a great time of year for it – stick it on all them grilled veggies or in all them tacos. Thanks a million, my dear!! I recently started juicing and I am slowing introducing kale into my recipes (to replace spinach)! I would love to check out this book on different ways to enjoy kale in my daily eating habits! One of my very favorite soups has kale, brown rice, and meatballs (veggie ones in my bowl) in it. Yummy! I recently made a solemn vow to serve kale once a week, and I absolutely need to get more creative with it. My repertoire to date has been quite limited (much to my family’s chagrin). I think they will really like this recipe. Thanks! I have never thojvht of trying kale this way. This will be a new experience for me. I just recently found your site and I’m loving your recipes. I’m excited to try your pineapple salsa, I love anything with kale in it!! Beautiful photos as well! Thank you for creating an amazing food blog! I can’t wait to try this, and put it on everything. Love your website and your great creativity with the cooking!!! The book looks awesome too! The salsa looks amazing! I would love to check out the cookbook- it’s nice that most recipes are GF 🙂 Hooray for kale! This would be a great book for us as we’re trying to eat more of a WFPB diet and less of the processed foods. I just tried Kale for the first time last week in a salad and I loved it! Now I need a cookbook for more recipes to use it with. Genius! 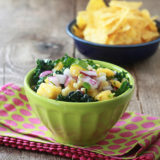 I love kale but never thought to add it to salsa. What a great way to ramp up the goodness. The cookbook sounds incredible. 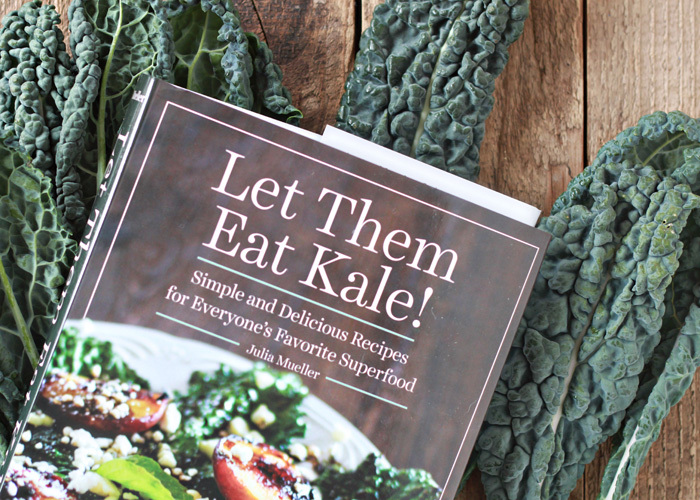 I want to love kale – maybe this book could help! Hi Karen! We apparently are neighbors as we share a group fb page. I came across your blog and want to tell you that I’m going to be sharing your blog immediately with my cousin who recently has gone vegetarian but hasn’t figured out how to feed the rest of her family, a husband and 4 growing boys! She will love this new inspiration! You are truly innovative, even if you feel like this is the norm, it is so hard to think outside of the box and get out of the ole recipe box routine. I’m so happy to have come across your blog. Hopefully we will meet sometime! Hi Jessica! What a small world! Thank you so much for your nice comment. I hope to meet you too! I ate a lot of kale growing up as a vegetarian for the calcium! Kale is definitely a favorite of mine and I think my family would eat more with different recipes to cook it! Would love to win the cookbook. I’ll have to checkout the blog. I grew Kale for the first time this past spring. I would like some gardening tips and to try growing some other varieties. I’ve also been growing chard which we enjoy. This salsa looks delish! I’m going to check out her blog also. Would love to win her cookbook ,too. kale is so good for you! i’m trying to eat more of it myself. so far, i’ve just made kale chips! Would love to use more kale in my cooking and this cookbook would inspire me, I’m sure! I have tons of Kale growing in the garden. I am a recipe crazed person looking for yummy recipes all the time! Your books looks wonderful. I also look forward to making Kale Chips. Love this!! This salsa looks absolutely delicious. All kale lovers in our household! Right now, just sauteed with tons of nutritional yeast, but we also love a good massaged kale salad with apples and raisins. Thank you for this giveaway! I’ve got a garden full of kale…would love some great recipe ideas to use it up! I’m always looking for new ideas for using kale! I love this twist! This salsa looks so interesting, I think I will have to try it! Would love to win the cookbook to learn new ways to use kale! I love kale! Wish I could get my kids to eat it!